The clock is now ticking towards the famous Indian Summer as the temperatures have started to creep up across many parts of the country. Yesterday saw many places in the Vidharba and adjoining parts of Chhattisgarh record around 42°C. The city observatory in Bangalore recorded 37.2°C just 0.1°C off the all time record for hottest March day. Closer home Salem, Karur Paramathi & Vellore crossed 39°C while Trichy, Coimbatore, Tirupathur and Dharmapuri crossed 38°C. Similar trend is expected today as well with Easterlies holding sway over large parts of Peninsular India and playing a key role in how the temperature pattern pans out over the day. 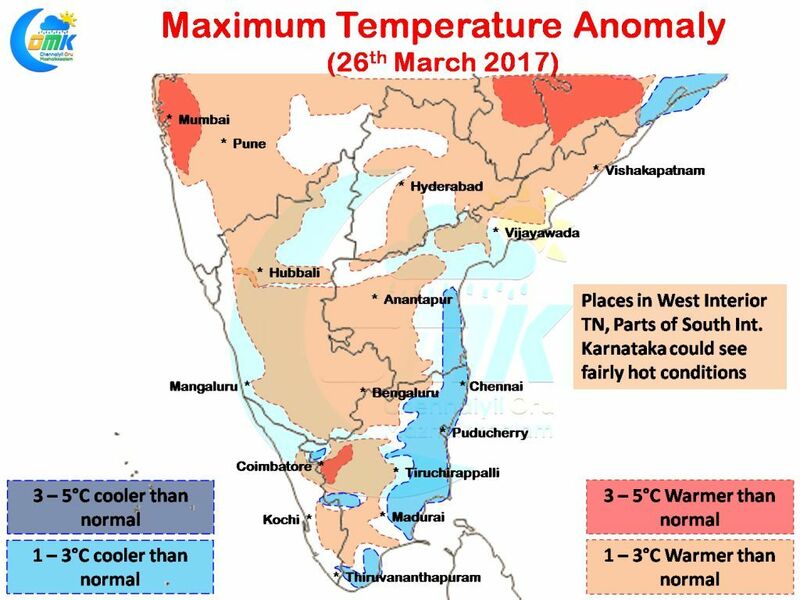 While the coastal areas of Tamil Nadu is likely to see near normal or slightly below normal day time temperatures all across the interior regions of Peninsular India the day time temperatures are expected to be about 1 – 3°C above normal. In particular like yesterday parts of Vidharbha & Chhattisgarh and isolated places in Coastal Maharashtra could see day time temperature anomaly of up to 5°C. Closer home interior districts of Tamil Nadu could see isolated places continue the trend of recording temperatures in the region of 38 / 39°C particularly in the North Interior districts of Vellore, Tiruvannamalai and the districts of Trichy, Karur, Namakkal, Coimbatore & Salem. Chennai and other coastal areas of Tamil Nadu will see day time temperatures in the region of 33 / 34°C making a far more pleasant day compared to the interiors.